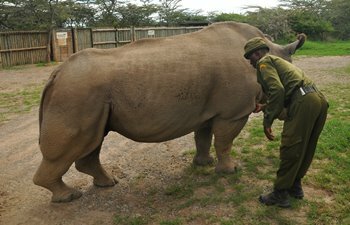 This is the second part of my blog about my trip to Kenya last May to see specific rhino projects which Real Africa is supporting through our partnership with Save the Rhino International. 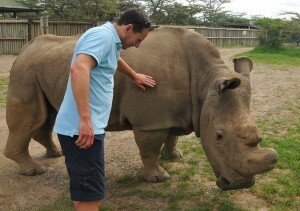 To find out more about this partnership or to support our #RealRhinos campaign please click here. To find out about our new partnership with Animals Saving Animals, a small organisation working in sub-Saharan Africa to train and deploy anti-poaching dogs, please click here. Driving across the Lewa Conservancy, jewel green following May rain, we saw a plethora of wildlife – huge herds of zebra, including Grevy’s Zebra with their distinct stripes and white bellies, antelope scattering as we made our way, and warthog raising their tails in alarm as we passed. After around 20 minutes we stopped as Rianto grabbed the binoculars and pointed to the horizon, where focusing our gaze we saw at first one, then two, then five rhino – a mix of both black and white. Rianto then counted and announced “Eleven Rhino” – we looked again, scanning the horizon, and sure enough wallowing in the mud and high on the brow of the hill were more rhino. I’ve never seen so many all in one place before – a great testament to the work of the Borana and Lewa rangers and conservation teams. 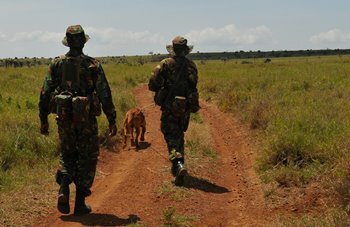 We carried on until reaching the headquarters of the Anti-poaching Dog Squad, one of the projects supported by Save the Rhino International which I had specifically come to Kenya to visit. 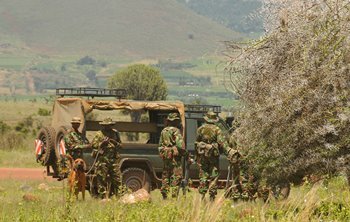 I could see a large bloodhound, poised and ready for action and the rangers all gathered around a small thatched boma. 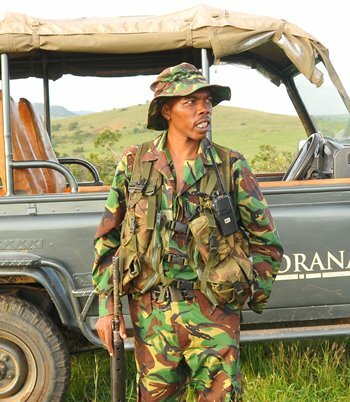 After being introduced to softly-spoken Wilfred and the rest of his dedicated team of rangers, Rianto helped to explain how the dog squads are used on Lewa and Borana to protect the rhino. There are around 160 precious rhino across the two conservancies – around 97 black and 63 white, although with the rhino successfully breeding this number will hopefully increase. Some of the rhino have the most spectacular horns, like Wai Wai, a female black rhino who has reared a number of calves on Borana – all need to be protected – patrolled day and night against the threat of poachers. 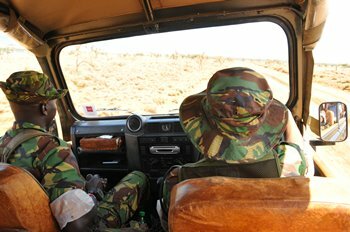 All the 4×4 safari vehicles have detailed ID booklets with pictures to allow you to identify the rhino as you move around the conservancies. 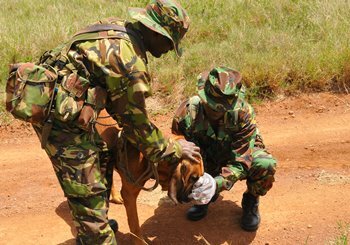 The anti-poaching dogs have two key roles: to track and attack poachers. 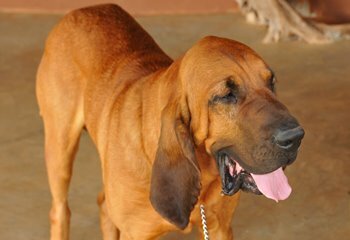 Bloodhounds are the trackers with the ability to cover vast distances over tricky terrain, tracking scent from a single footstep for over 24 hours. Belgian malinois are the attack dogs although they also have the ability to sniff out illegal arms and caches of ivory and horn. 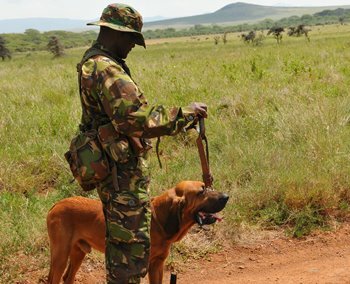 GPS tracking devices are attached to weapons when they are discovered by the dog teams, who then retreat, waiting for the poachers to return for them. They can then apprehend the whole group. With regards to attack, dogs are naturally feared in Africa so add to this a dog which has been specifically trained to attack and disable the ‘gun arm’ and you have a very powerful deterrent. Wilfred was keen to show the dogs and the rangers in action having given us a summary of their skills. Tony the malinois was out on a mission so the job lay with Tipper the bloodhound. It was decided that my husband Mark become a dummy ‘poacher’ and I would join the tracking team to see the process from start to finish. Mark was asked to walk on the stony sand, leaving a single footprint, before heading off across the grassy plains accompanied by some rangers. I stayed with Wilfred and his track team with Tipper. First Wilfred explained how Tipper had been trained – when the chest harness is put on to the dog, he knows it is time to go to work. True enough, as soon as Tipper was harnessed his body language seemed to change and he was eager to move off, just like a dog at home waiting for his walk. One of the rangers then put gloves on and got a polythene bag with a gauze pad within it. Being very careful not to contaminate the gauze, he pressed it down hard on the stony sand where Mark’s footprint was. He then placed the bag containing the gauze over Tipper’s nose for no more than a few seconds. Tipper immediately started to pull his handler and off we went, first along the stony sand track at a fast walk, then a gentle jog and before I knew it we took a sharp left, leaving the track, running through the long grasses of Lewa. The track team, who train hard with long runs led by Pete Newland, ex British military, had no trouble keeping up with Tipper. I wish I could say the same! In the back of my mind I was thinking about puff adders in the long grass where we were running! When we finished the exercise and had regained normal breathing I did ask Pete about this and he said they haven’t had too much trouble at Lewa/Borana but further north in the Sera Conservancy where he also works with the Northern Rangelands Trust, puff adders can at certain times of year be a problem. He had just purchased six viles of antidote at $1,000 US a vile . The antidote can be used for rangers and also for the dogs should they be bitten. Tipper was incredibly focused on his path and there was no dithering about. A few kilometres later, we found ourselves on a dry river bed and by the time I caught up with the rangers, Tipper was happily slobbering all over Mark who had been primed for his arrival with a treat. 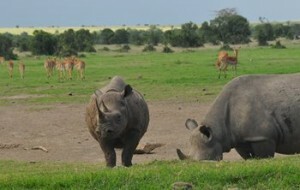 It was an impressive display of how these track dogs play an important role in protecting rhinos. 50% of the money that we raised through our #RealRhinos campaign in aid of Save the Rhino International has gone to help the Dog Squads in Kenya. We hope to buy vital equipment for them, from bite suits which cost around £500 each to dog food at £7 per week. 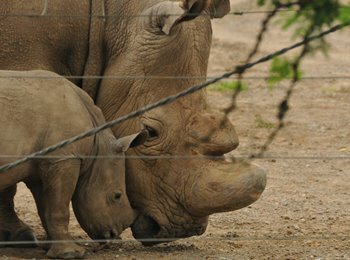 We want to help pay for veterinary care for the dogs and also the rhinos – to pay for a vet to treat a rhino that has been shot costs around £1000. The rangers need our support too – they need basic supplies like boots and hats so that they can carry out their day to day duties. To date our campaign has raised £6500. 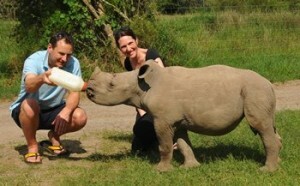 By going on safari with us or buying a rhino Tshirt from our Real World Store you can help us raise even more. We have also ‘adopted’ a puppy – a Belgian Malnois – who is now 5 months old, has had his vaccinations and has started his training with Daryll Pleasants from Animals Saving Animals. The puppy will eventually be deployed to an anti-poaching dog squad working in the Save Valley in Zimbabwe where one of only eight viable black rhino breeding populations can be found. This was my first visit to the eastern Laikipia region – I wish someone had told me how beautiful this region is as I would never have waited so long to visit. Part of the appeal of this area to me is seeing how the traditional cattle ranches have diversified, embracing conservation and tourism. 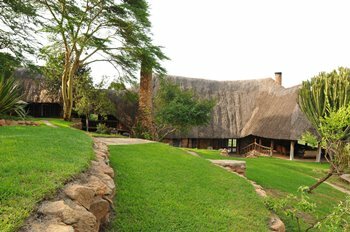 The lodge at Borana has a real homestead feel, with beautiful gardens and guinea fowl casually strutting across the lawns. The walls are adorned with historic black and white images telling the story of Borana from the trophy hunting days to the forefront of the modern conservation movement. Borana remains family owned, by Michael and Nicky Dyer . 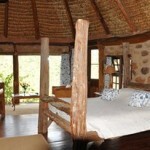 There are just eight beautiful cottages perched on the side of the valley – all thatched, with decks and log fires. We were in Room 4 – a very pretty room close to the main area decorated in blue and white with a huge four poster bed carved from local wood at the centre of the room. 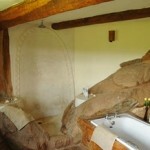 Downstairs was a lovely bathroom, fashioned from the rock. We enjoyed an alfresco lunch at the pool, with produce from the farm – quiche with salads and beef carpaccio. The beef comes from the Borana cattle and is supplied by Michael Dyer’s son, the ‘Well Hung Butcher’ . Cattle ranching is how Borana started but nowadays although cattle still graze the grassland there is holistic land management with their grazing carefully monitored in order to enhance grazing for wildlife. Cattle play an important and often overlooked role, reducing moribund grass biomass, promoting seed dispersal and increasing the nutritional value of the grass while decreasing the risk of bush fires. Milk, eggs, fruit and vegetables are harvested from Michael’s parents garden, Tony & Rose who still live on Borana – Tony just celebrated his 90th birthday. All this fresh produce and a wonderful kitchen team ensured all the food we enjoyed was just delicious. In the afternoon we joined Flick, who manages the lodge, for afternoon tea and cake before Rianto collected us and took us to the anti-poaching headquarters to meet Flick’s husband Sam Taylor, who heads up operations. It was fascinating to see the HQ and speak to Sam and the rangers about their work. 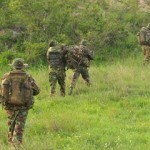 We were invited to join the rangers on a deployment. On our way we saw lots of wildlife including a very friendly herd of elephants. It was great to see the rangers all whip out their phones to take photos for their families and get as much joy out of the encounter as us. The rangers talked us through their kit, which includes weapons and a heat seeking camera per team. They explained how they stay in the same team of four of five rangers – this way they get to know their roles and how best to work together. 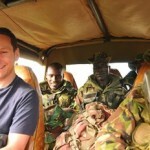 The rangers receive training, board and lodging and a good salary in Kenyan terms of around $500 US per month. What struck us was the pride the rangers took in their position – they want to protect the rhinos just as much as we want them to. During our short stay it was overwhelmingly apparent that the conservancies work very much in partnership with the community. From funding a mobile clinic which roams for miles providing health care in areas that would have very little access otherwise, to an education support programme which has helped to put dozens of children through school. We checked in on Linda, one of the rhinos that the team we had joined were working to protect before reaching a site on the western border of the conservancy where the rangers were to set up their overnight watch. We watched the rangers go through their routine, climbing to a brow of a hill to make a camp before setting off. The sun was starting to dip, jackals crossed our path and a huge herd of buffalo seemed to surround us as we made our way to neighbouring Laragai House for sundowners. A perfect setting for ice cold gin and tonics and nibbles. Returning to the lodge, after negotiating hyenas, we found a cosy glow from the newly laid fire in our cottage and steaming hot water with an abundance of lovely Cinnabar Green natural soaps and shampoo to enjoy. Dinner was a real ritual and felt very special- first we met for drinks in an imposing sitting room with long bar and a vast fireplace surrounded by comfy sofas and arm chairs with dogs snoozing on the rugs around the room. We then moved into the dining room to sit at a huge wooden table for a leisurely candlelit dinner. The chocolate souffle (with a glass of Amaretto) was divine! 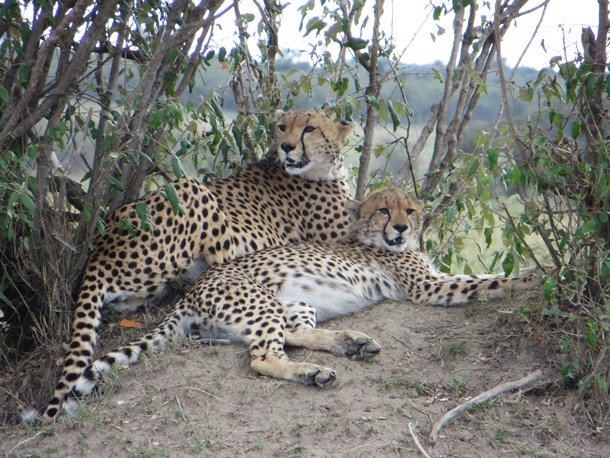 One night free at Borana – valid for travel all year excluding Christmas/New Year. 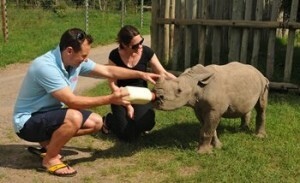 Borana Conservation fee of $105 per person payable for free night. You can now stay 3 nights for the price of 2 at Borana – exclusive to Real Africa’s #RealRhinos campaign. In addition to you benefiting from a wonderful free night, the Dog Squad will also benefit as the Real Africa Trust will make a £50 donation to Save the Rhino International, per person on behalf of all clients booking this deal. To visit the dog squad from Borana costs an additional £90 per person – this comprises a small fee for the dog squad plus the Lewa conservation fee of $105 per person per day. We recommend heading over to Lewa for the whole day, enjoying a safari on this side of the conservancy, a dog squad visit and a lovely picnic lunch before returning to Borana. Please ask us for details. Laikipia is currently experiencing a drought – you may have read reports of looting in the western region of Laikipia – please visit our News section for an update here. Francis is one of our safari guides in Kenya. During August he took a group on safari to Amboseli, Lake Nakuru and the Masai Mara – a classic safari circuit taking in three distinct landscapes. 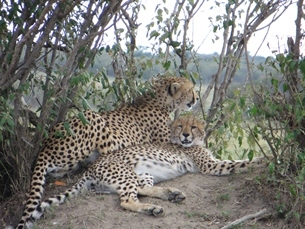 It was in the Mara that Francis and his guests stopped to observe these cheetahs relaxing in the shade. Francis took a series of wonderful images (below). Amboseli, to the south east of Nairobi, ensures great sightings of elephants as well as wonderful panoramas of Mount Kilimanjaro. 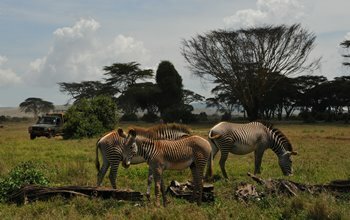 The park is very scenic with natural springs fed by Mount Kilimanjaro and habitats ranging from swampy, marsh areas – ideal for wallowing elephants, hippo, buffalo and a variety of water fowl – to dry savannah grasslands where antelope, zebra and other plains game congregate. Lake Nakuru is one of the soda lakes in the Great Rift Valley lying 1754m above sea level in Kenya’s north-west zone. 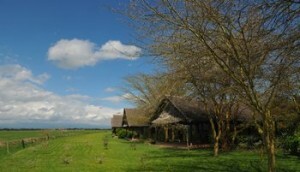 The lake is surrounded by woodland of yellow acacia and euphorbia, and bushy grassland. The Great Rift Valley lakes are known for prolific birdlife, with around 450 species in evidence, including a wonderful variety of raptors including the African Fish Eagle. Waterbirds are a highlight – you can see Goliath Heron among others and depending on the level of the lake, Greater and Lesser Flamingoes. 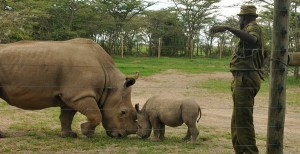 Importantly the area around Lake Nakuru is a sanctuary for endangered black and white rhino. 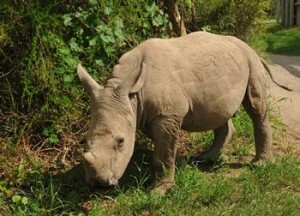 The sanctuary was established in 1984 and now boasts 60 black rhino and 40 white rhino as well as Rothschild Giraffe. We also love combining a stay at one of our lake properties for some R&R time in the middle or at the end of your safari. Many of our properties enjoy wonderful views, with perfectly placed decks for sitting and soaking up the atmosphere and fabulous log fires to ward off chilly evenings. The Masai Mara is an absolute must-visit destination and among the world’s greatest wildlife reserves. For those short of time you can fly in, to connect with your international flight arrival. We recommend a minimum stay of three nights in the Mara but you can easily do more and stay at a combination of camps in different areas. Our tip – opt to stay in a private conservancy bordering the Mara, like Mara North, where Masai Landowners and lodges and camps work together for the good of conservation and there is a strict low density policy with 1 tent to 700 acres of wilderness. 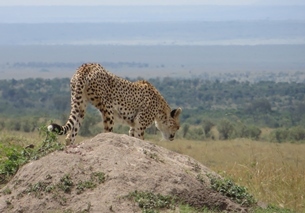 The Mara is a prime area for viewing big cats, with the highest lion density in the world. The best time to view the Great Migration in the Mara is from July, when the Migration tends to arrive, right through to September/October time. However the Mara is a year-round destination, and far quieter with regards to visitors at other times of year when special offers can be also be taken advantage of. June and November are great months to visit while March guarantees the Mara minus the crowds with the Loita ‘Mini Migration’ in full swing, flowers blooming on the plains and trees around camps fruiting which in turn draws in the animals for really close encounters! There are to many camps to name and which one to go for depends on the time of year and your preferred style and budget. However, here are some of our absolute favourites! All our safaris are tailor-made and can be put together to suit you so please give us call to discuss your plans on 01603 283 517. Robert Ferguson, a Director of Real Africa, remembers the occasions on safari he’s got more than he bargained for. When presenting slideshows or giving talks, I’m often asked what’s the scariest thing that’s ever happened to me on safari. It’s a tricky question. I’ve never been frightened when out game-driving, not in the “O my god, I’m going to die” sort of way. Having been lucky enough to have done a fair amount of game-viewing ( a definite perk of the job) while running Real Africa, I have however been in several situations that have got the adrenalin pumping. The first was when I was visiting a private reserve in the south of Swaziland. 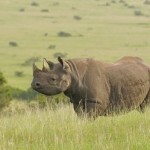 It specialised in the protection of rhino, specifically the rarer and more aggressive black rhino. I was out with the reserve founder and owner, a grizzled old Africa hand who’d worked in conservation for many years. We were doing the early morning patrol of the electric perimeter fence checking for any damage from poachers during the night. Cresting a small ridge we spotted a rhino standing beside the track we were following. We stopped. The rhino got up on his toes and stood staring at us. We sat for 30 seconds or so looking at each other. We started our engine, my companion confidently telling me that after this show of bluff the rhino would turn on his heels and retreat into the thick bush. We edged closer and it didn’t look to me as if it had much thought of retreat. We were about 15 metres away when it charged. How such a large and prehistoric creature went from stationary to fast so quickly was unbelievable, and before I could catch my breath it hit the well loved and well used Landover we were in. Just my luck, it was my side. Its horn came straight through the panel of my door, sticking into the foot well in front of my legs. It lifted its head and us with it, both wheels on my side off the ground as it tried to push us sideways. When we didn’t move, it retreated backwards, pulling its horn clear as it prepared another thrust but before it had a chance we were slammed into reverse and careering backwards up the track at a filling-shaking speed. It chased us for 50 metres or so until it and we lost sight of each other in the dust. I returned to the reserve a couple of years later and was pleased to see my passenger door mounted over the fireplace, the puncture hole and rip in the metal looking very dramatic. Frightening? No. It happened so quickly and was over before I could think. If you see a Rhino, climb a tree.. I thought of this incident a few years later when I was doing a walk in The Royal Chitwan National Park in Nepal. With a population of Asian Rhino we were informed my our guide that should we be spotted by one we should keep completely still as their eye sight is poor and they detect movement as much as form. Should they charged we were advised to climb a tree. I looked around at the tall scrub all around, spotting only a single solitary tree that stood a chance of taking my 13 stones without snapping like a twig. I looked around the group, most of whom were eyeing the same tree with a determined stare. If push came to shove, I decided, I’d take my chances with the rhino. The snakes were standing taller than me, and I’m 6’3..
On another occasion I was checking out camps and lodges in Botswana. I’d arrived at a camp deep in the marshes around the Okavango Delta and was heading out for a game walk with two local guides. It was a great walk, elephant waded in the waters eating the lush grasses that grew there, antelope and other grazers watch unperturbed as we walked quietly by. They one of the guides spotted something in front of us that looked very strange. It was about my height, 6 feet or so, black and seemed to gently sway from side to side. We cautiously moved a little closer, to perhaps 50 metres or so, until one of the guides realised what it was. It was a Black Mamba snake. Or rather it was two Black Mambas engaged it a very beautiful mating ritual. Standing on their tails they were facing each other and gently undulating from side to side, mirroring each other as they entwined their necks. Amazing though it was the thought in my mind was that if they were standing 6 feet into the air and yet still had enough of their bodies on the ground to keep them stable during such a dance, how big were they? My guides obviously had the same thought as we quietly and gently beat a retreat away from them. The warthog loved crisps and tried his best to get as many as he could. The closest encounter I’ve ever had with an animal on foot was a warthog. Doesn’t sound scary, despite their incredibly ugly faces including some mean looking tusks. It was at a lodge in South Africa that had a tame warthog living under the raised floor of their restaurant and bar. It was a big boar and very partial to crisps and other bar snacks which it tried to make you drop by startling you when it thought you were not expecting it and were poised to put a bar snack in your mouth. More dangerous was a face to face encounter with a hippo one evening while walking from my tent to the dining room in a mobile camp in the Masai Mara. Hippos, as most people know, are the biggest killers of humans in Africa, due to their nocturnal wanderings in search of grazing bringing them in contact with people going about their lives. Luckily for me he was 20 metres away and heading across the path not along it. I did however beat a hasty retreat to my room and wait, as I’d been instructed, for my Masai Guide to come and fetch me. tI wasn’t a marketing stunt after all, the Masai guides were actually there to assist and protect, not to make it seem more real and look good in the photos. Lesson learnt. I now always wait for my guide at night. The elephant sniffed her face, no more than 5 cm away from her nose..
As regards the big cat – lions, leopards and cheetah, I’ve never had any real incidents. 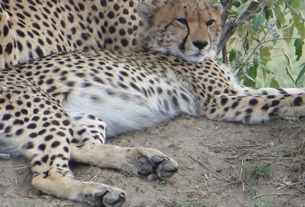 A cheetah once sat on my vehicles bonnet but that was an amazing experience, not a scary one. I once got sprayed in lion urine by a lion marking his territory on the front wheel and being a bad shot. Again, not scary only rather smelly. 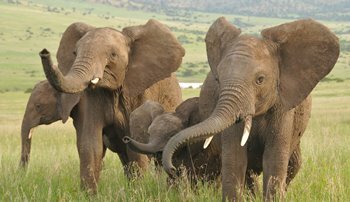 When game viewing with my family in the Cape provinces of South Africa an elephant came right up to our open vehicle and stopped, raised its trunk and sniffing my eight year old daughter, its trunk a few centimetres from her face. But it was a young female and she was interested in her rather than aggressive. My daughter loved it and still talks about it five years later. I’ve been incredibly lucky in the amount of time I’ve got to spend in the wild with the animals of Africa, and I still get the buzz of excitement when I see lion or leopard or even a dikdik or zebra. Adrenalin yes. Excitement, of course. Fear? Never. Honest. South Africa has tried to go one better by introducing the “Big 7” in their Cape Provinces. This included the main five and adds Great White Sharks and Whales, giving the list a more nautical feel. Just like the original 5 however it still concentrates on big, powerful and deadly, a throw-back to when the creatures were being stalked as worthy trophies. They’re all breath-taking and well worth seeing. But there are many other creatures that are just as fun to see, even if not so big and bad. Here’s another “5” that we think’s well worth looking out for, even if your friends and family may not be so impressed with the photos upon your return. These tiny antelope look as if they are young fawns even when fully grown, ensuring that everybody always wants to “bring one home”. Big doleful eyes, trembling with nervous energy and twitching nose always checking for danger makes them hard to see but worth the effort. Boy, these are ugly! A wild pig, resembling a boar, they live below the ground in burrows emerging when they think the coast is clear to forage for just about anything. When alarmed they run away with their tails bolt upright like a radio antenna. Found in Southern Africa, these busy creatures are a type of mongoose and live in large communities. They too live in extensive burrows and will set one or two sentries as the rest forage for food. When disturbed they stand on their back legs to get a better look, their heads often twitching in time. cracks and caves in the rock as home. Their agility is impressive, displaying a sure-footedness that keeps them seemingly glued to the rock face. They are also, rather surprisingly, the closest living relative to the elephant. 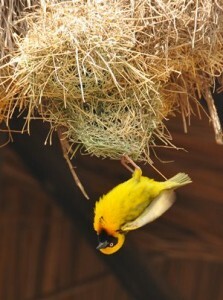 As well as the Big and Little 5’s there are also many other animals, birds and reptiles to enjoy while on safari. Giraffe, zebra and hippo’s are all synonymous with African safari and nearly always seen. Cheetah grace the plains, hyena and jackal follow the lions. Its not about seeing one particular animal or another, its seeing and experiencing the whole that makes a safari such an experience. But don’t forget the little ones..